Bosch builds up self-driving capability in U.S.
DETROIT -- As U.S. automakers tool up to produce self-driving cars, Robert Bosch expects to be a key player. The German megasupplier can draw on the resources of r&d centers in Palo Alto, California, Chicago and Pittsburgh, and it is scouting Silicon Valley startups for possible partners. 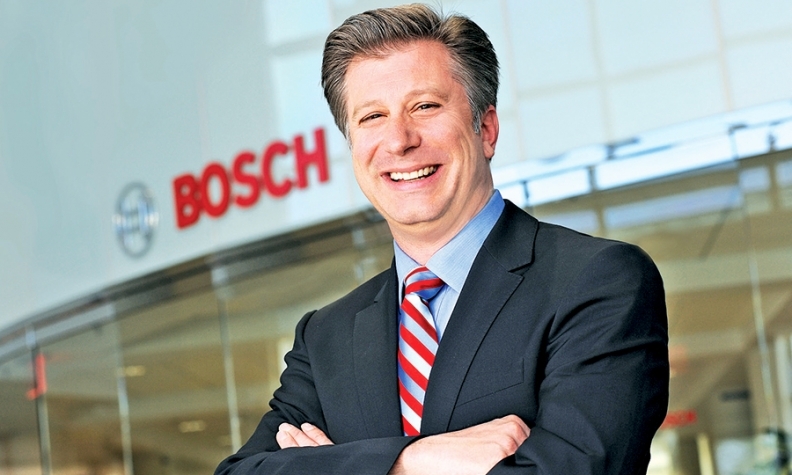 Last month, Mike Mansuetti, president of Bosch's North American operations, was interviewed by Staff Correspondent David Sedgwick at the Detroit auto show. Mansuetti detailed the company's development of sensors, software and chassis components for driverless cars. Q: Have you got engineers in North America to develop technology for driverless cars? A: Yeah, we're putting together those building blocks. Things like radar and sensors are currently in place, and as the technology advances, they'll grow. We also make antilock brakes and chassis control systems, and we just added steering systems with the acquisition from ZF. Those guys have been integrated into our Plymouth, Mich. facility. That's done. So in Plymouth we now have steering, chassis, drives and electronics all in the same building. How many of those parts are produced in North America? A good portion. ... Steering systems are produced in Kentucky; a lot of electronics are produced in Juarez, Mexico, and Charleston, S.C., is our main hub for antilock brakes, traction and stability control. How much of Bosch's r&d is in North America? We have a group of folks in Chicago working with our r&d guys in Palo Alto and Pittsburgh. In Palo Alto we have 100 folks, and in Pittsburgh we have 30, and in Chicago we have close to 20. Now that Bosch has a partnership with Dutch mapmaker TomTom, is any of that development in the U.S.? Right now, it's mostly in Europe. They are collaborating with our chassis guys. Our r&d people in Plymouth, Palo Alto and Germany are working with them. Describe the activities of your technical center in Palo Alto. In 1999 we sent a scouting crew to Palo Alto. Now that office is up to 100 r&d engineers, plus the same number of people on the business side. We also have a separate venture capital group in Palo Alto. And we have a startup incubator, too. We're trying to bring everything together. Bosch also has a program to encourage internal startups, right? We have a program to nurture these internal startups. Ten years ago, that's how Bosch Sensortec started up, and also eBikes. We also have partners like Seeo Inc. [a startup in Hayward, Calif., that is developing lithium ion batteries]. The venture capital group is working with them. Let's talk about your overall business. Is Bosch adding capacity in North America to keep up with record vehicle production? We did some expansion last year and will continue to do so for our customers in North America. We have a target to double the size of our North American business from 2012 to 2020. Are your North American plants running flat out? We're pretty comfortable. We didn't have any trouble last year meeting our production requirements. It depends on the product, as always. We had a lot of expansion last year in Mexico, getting the plants geared up. On fuel injection, we've been growing our capacity in Charleston and also production of fuel rails in San Luis, Mexico. We're continuing to invest, but everyone is being careful. How about your suppliers? Do you have a watch list? Yeah, of course. We beefed up our purchasing capacity to look for new suppliers and prepare for [product launches]. Transmission control was one area that we ramped up substantially, and solenoid valves. There are a lot of suppliers that we're partnering with. Has the strong dollar affected Bosch? Not much. We always had a strategy to produce locally for local automakers. It's a pretty balanced approach worldwide, and we haven't really changed that strategy. We are continuing to localize production more and more. We're producing more and more parts in North America for North American automakers.